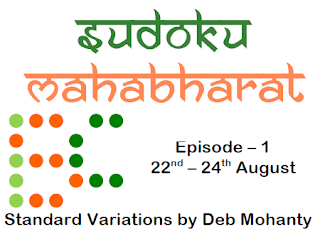 Sudoku Mahabharat Episode-1 containing standard Standard Variations held will be held from 22 - 24 Aug, 2015 on Logic Masters India website. Everyone enjoyed 2015 year edition of Sudoku Mahabharat. So to continue with the success of Sudoku Mahabharat, this competition will not server as qualifier for Indian Sudoku Championship 2016. So top 50 players in this competition will be invited to participate in offline finals of Sudoku Mahabharat as well as India Sudoku Championship. Qualification criteria for both of these championship is mentioned on LMI website. Instruction Booklet for the first episode of Sudoku Mahabharat is released and it contains the standard known variations of Sudoku. Below are the Sudoku variations which are going to appear in this championship. I have posting links to these Sudoku types which will lead you to the practice puzzles. Best of luck to all the participants of this championship. Looking forward to participate in this championship.